Brent S. Colasurdo is an associate with Umberg Zipser where he focuses his practice on complex commercial litigation, intellectual property disputes, and government and regulatory matters. He has experience representing a wide variety of clients in complex disputes, ranging from real estate developers to clean-tech startups. 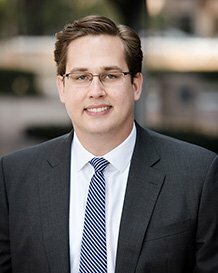 Brent serves on the Board of the Federal Bar Association of Orange County Young Lawyers Division and as Editor in Chief of the Federal Bar Association of Orange County Newsletter. He is an active member of the Orange County Bar Association, Federal Bar Association, Association of Business Trial Lawyers, and American Bar Association. Prior to joining the firm, Brent served as a law clerk to the Honorable Cormac J. Carney and the Honorable Alicemarie H. Stotler in the United States District Court for the Central District of California from 2013 to 2015. Brent graduated from the University of Southern California Gould School of Law in 2011, where he served as Senior Submissions Editor on the Southern California Law Review and as a Writing Fellow in the Legal Writing and Advocacy Program. His publications include Behavioral Addictions and the Law, 84 S. Cal. L. Rev. 161 (2010). Represented The California State Controller’s Office in a dispute with SAP Public Services, Inc. (SAP) concerning the failed modernization of California’s state employee payroll and benefits system. The matter resulted in SAP’s payment of $59 million to the State of California.